Mahindra Spark the Rise is an initiative by the Mahindra Group to provide innovators, entrepreneurs, and change agents with an open innovation platform to showcase their work and connect with like-minded people to amplify their efforts. The team’s core purpose is to drive positive change in the lives of their stakeholders and communities across the world. Spark the Rise empowers people to drive positive change by bringing them together through innovative ideas and awarding the grant money needed to put them into action. I recently had an opportunity to chat with Karthik Balakrishnan, senior general manager – Corporate Brand Management and Business Transformation, Mahindra & Mahindra about Spark the Rise. Sriram Gutta: Can you briefly talk about your initiative Spark the Rise (STR)? What were its origins? How did you come up with the name? Karthik Balakrishnan: Spark the Rise is a unique online platform for change-makers across India to connect with one another, collaborate and exchange ideas, enlist volunteers and donors, and receive grants from Mahindra. Spark the Rise is an attempt to help people experience the power of our brand idea, expressed by the word “Rise” – that people with aspirations can “Rise” to achieve them by challenging conventions, thinking alternatively and driving positive change. We believe a program of this kind delivers more benefits to the brand than conventional advertising – by letting people experience and engage with the idea. When we were thinking about different ideas to take “Rise” to the outside world, we asked ourselves if doing something unconventional was the best way forward. We looked at one of the key principles of “Rise” – the principle of “empowerment” and asked if we could empower those who are already making a difference. How could we multiply their impact? What could we do to help others “Spark” positive change? So in August 2011, we launched sparktherise.com – a call to action for people to take charge of the things they want to see changed for the better. To enable themselves and others they represent – to Rise. a. Connecting change makers with one another so that they are able to collaborate, exchange ideas, enlist volunteers and donors, and make things happen. c. Supporting entrepreneurs and innovators through mentorship, workshops, and on-the-ground events across the country. 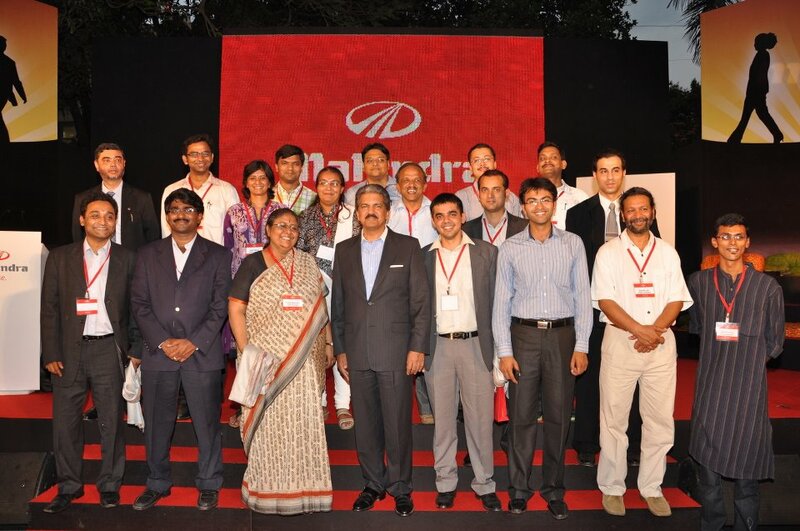 SG: Apart from seed funding, does Mahindra support the winning ideas/projects in other ways? KB: Through the website and social media channels, ‘Sparks’ (people/organizations who have submitted their ideas) gain the visibility needed to attract funding, volunteers, mentorship, and media coverage. Some of our Sparks have even been featured on a television show on India’s most popular English news channel – Times Now. These stories even feature in our advertising, giving them additional mileage. This year, in addition to giving grants and publicity, we’re inviting successful Sparks to Mumbai for a two-day capacity-building workshop, where they learn everything from pitching to investors, to articulating their vision, to measuring their social impact. Additionally, we pair them with mentors who help them reach their growth and impact goals for the next two to four months. Finally, we provide all our Sparks with access to a host of events across India where they can showcase their work and access a wider network of change-makers. SG: STR’s multiround winner format is quite different from most b-plan competitions – what was the motivation behind the rolling selection process? KB: We want to reach as many people as possible, and we realize for a movement to be successful, it takes time for people to hear about us and be galvanized into taking action. Thus, to maximize people’s opportunities to interact with Spark the Rise and to maximize the number and quality of grants we disburse—we spread out the grant-giving process across multiple rounds. The first edition received over 6,000 submissions, with 1,473 meeting impact, feasibility and innovation requirements for posting on the site. 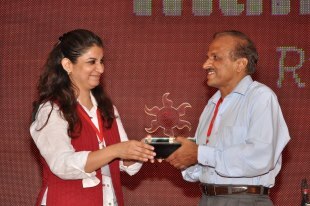 At the end of the season, Mahindra had given 48 grants totaling approximately US $500,000 to change-makers across India. Unlike other b-plan competitions, we also included public voting in the selection of grant winners to encourage innovators to spread the word. The result: collaboration among innovators, an exchange of ideas, mentorship, and even funding. Last year, innovators marshaled 740 volunteers and received advice from 473 experts. And they spread awareness to over 2 million people who visited the site and our social media channels. And we’re only getting started! SG: What is the kind of impact that the first season of STR created? Has it met your initial expectations? KB: This is the first time that Mahindra initiated a movement with a marketing campaign of this magnitude and with such high aspirations—to tap into the hearts and minds of people who are helping India Rise. So, we did not really know what to expect. The results were inspiring and heartwarming: we received over 6,000 submissions from across the country, 743 volunteers came forward, and 473 experts provided mentoring and advice and we reached out to over 2 million people. But what’s most important is the stories behind the numbers. People responded to our call to action, and are making a difference in ways we had not even imagined. For example, one of our round winners came to Spark the Rise with an idea for a virtual way for busy professionals to give back to society by planting trees while supporting rural livelihoods. A year later he has quit his job and is now dedicated to this nascent profitable business full-time—Sankalp Taru. Another submission involved an idea to set up a BPO in a rural area and train villagers to run the BPO – this BPO is now up and running. SG: How have the winners from the first season fared since the grand finale earlier this year? KB: Some of them came to Spark the Rise with ideas, which they have now turned into reality, and yet others came to Spark the Rise with already existing projects, whose scale and impact they have multiplied. In the first category, for example, Sankalp Taru, did not exist before Spark the Rise, and now promoting biodiversity and rural livelihoods is only a click away! In the second category, for example, AVANI, which harnesses the power of pine needles to generate electricity in a remote part of India, has used the grant money to run their training of plant operators who will by December 2012 set up and run their village-based 120 KW power plant in Chachret village of Pithoragarh district in Uttarakhand. Moreover, as a result of media coverage and exposure due to STR, Cummins India, the country’s leading manufacturer of diesel and natural gas engines, has shown interest in their work. Another example is Make a Difference, a youth platform that provides a safe learning environment for children in orphanages, street shelters and poor homes. Today they have a volunteer network of more than 1,000 teachers working across 23 cities, working with over 3,500 students. SG: Coming out of the first season, were there things you wish you had done better? What adjustments did you make for the second season? 1) Make participation as easy and transparent as possible: Last year, people had to access the Internet to vote. This year, we have provided multiple means for people to cast their vote – through an SMS or even through a miss-call from phones or mobiles. 2) Don’t try to do everything yourself: Last year, Spark the Rise was run primarily by Mahindra. But we realized that if we wanted to provide in-depth support to our community, we had to reach out to a wider ecosystem of experienced partners. Thus, this year we have deepened our partnership with The Indus Entrepreneurs (TiE), and begun a partnership with Dasra and Innovation Alchemy to provide the community with mentorship, access to events, and more importantly access to a wider network of change agents across India. SG: Have you started thinking about season three? What other additions might we see in 2013? KB: Season three is definitely on our minds, but we want to take Spark the Rise one step at a time, ensuring that we are truly meeting the needs of innovators and entrepreneurs across the country. We do not claim to have got everything right this time, so our focus is to listen to our community so that we can learn, adapt and ensure season three takes the work we have done to the next level. That being said, one area where we will continue to focus on is building the entrepreneurial and innovation ecosystem in India: building more and more partnerships so that Sparks are connected to the right people and resources.